Bishop and confessor, born in South Wales; died 28 July, 565 (?). The date of his birth is unknown. His parents whose names are given as Amon of Dyfed and Anna of Gwynedd, were of noble, but not royal, birth. 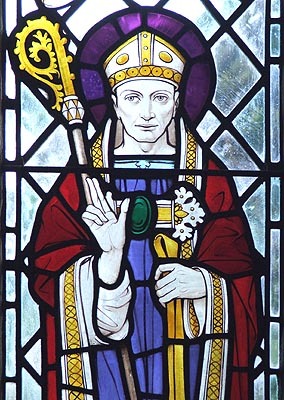 While still an infant he was dedicated to God and entrusted to the care of St. Illtyd, by whom he was brought up in the monastery of Llantwit Major. He showed exceptional talents in his studies, and was eventually ordained deacon and priest by St. Dubric. After this he retired to another monastery, possibly after that on Caldy Island, to practise greater austerities, and some years later became it abbot. About this time some Irish monks who were returning from Rome happened to visit Samson's monastery. So struck was the abbot by their learning and sanctity that he accompanied them to Ireland, and there remained some time. During h is visit he received the submission of an Irish monastery, and, on his return to Wales, sent one of his uncles to act as its superior. His fame as a worker of miracles now attracted so much attention that he resolved to found a new monastery or cell "far from the haunts of men", and accordingly retired with a few companions to a lonely spot on the banks of the Severn. He was soon discovered, however, and forced by his fellow-countrymen to become abbot of the monastery formerly ruled by St. Germanus; here St. Dubric consecrated him bishop but without appointment to any particular see. Now, being warned by an angel, he determined to leave England and, after some delay, set sail for Brittany. He landed near Dol, and there built a monastery which became the centre of his episcopal work in the district. Business taking him to Paris, he visited King Childebert there, and was nominated by him as Bishop of Dol; Dol, however, did not become a regular episcopal see till about the middle of the ninth century. Samson attained the age of 85 years, and was buried at Dol. Several early lives of Samson exist. The oldest, printed by Mabillon in his "Acta Sanctorum" from a manuscript at Cîteaux, and again by the Bollandists, claims to be compiled from information derived from Samson's contemporaries, which would refer it to about 600. Dom Plaine in the "Analecta Bollandiana" has edited another and fuller life (from manuscript Andeg., 719), which he regards as earlier than Mabillon's. Later lives are numerous.